Much colder air has filtered into the region overnight. Thursday will feature partly cloudy skies with gusty west winds early. Highs will be 10 to 15 degrees colder than Wednesday, in the mid to low 30s. Our next storm system slides south of the region Thursday night. A Winter Weather Advisory is in effect for Barnstable, Dukes, Nantucket and Plymouth counties in Massachusetts and Washington County in Rhode Island from 1 to 11 a.m. on Friday. This system will bring a period of light snow to southeastern Massachusetts starting late Thursday night. Overnight lows will bottom out in the low 20s. 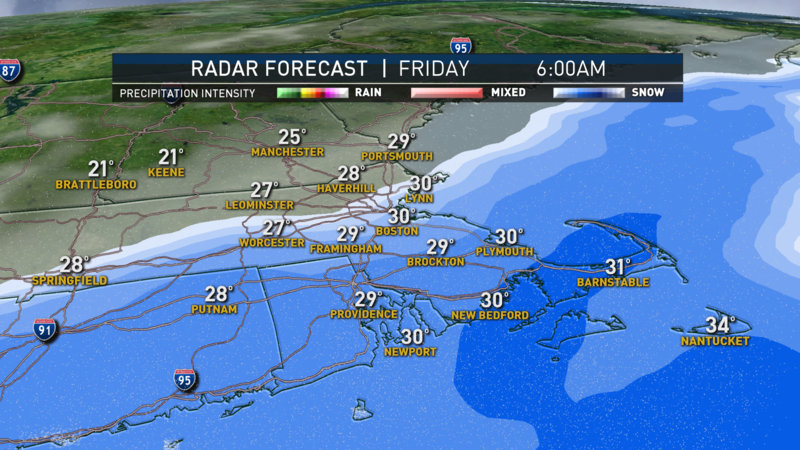 We will be waking up to snow falling across the Cape and Islands on Friday morning with the heaviest snow falling between 5 and 10 a.m. Roadways will be snow-covered for the morning commute, with reduced visibilities. We're expecting a general 2 to 4 inches when all is said and done late morning across Cape Cod and the Islands and 1 to 2 inches along the Providence-Taunton-Plymouth corridor. Elsewhere, mostly cloudy skies prevail with highs in the 30s. The coastal low will be well offshore by Saturday as a brief area of high pressure noses into the region. Another coastal low will approach the region from the south. At this time, it is looking like southeastern New England may once again flirt with plowable snowfall on Saturday. More details to come. Highs will range from the upper 20s to low 30s south to the upper teens north. A polar cold front sweeps across the region on Sunday, ushering in another arctic airmass. 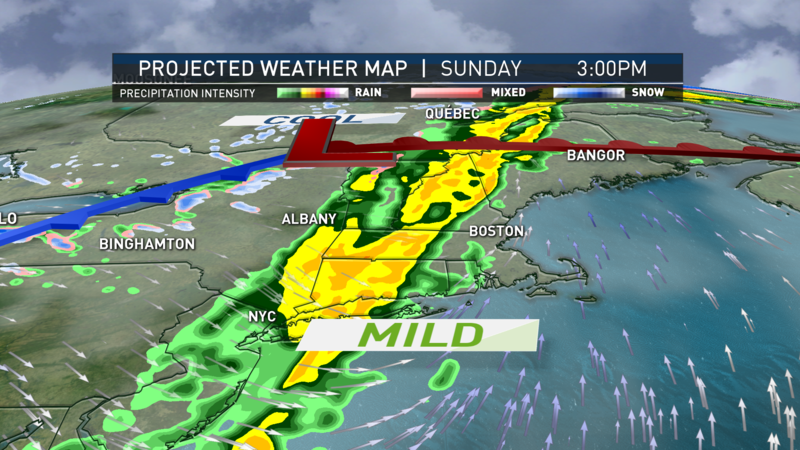 Highs will not get out of the 20s on Sunday with partly cloudy skies. Overnight lows on Sunday will plummet into the single digits across most of New England. Sunny skies are in the forecast on Monday as cold high pressure slides into New England, highs won’t get out of the upper teens to low 20s. Mostly sunny weather continues for Tuesday with highs moderating into the mid to upper 30s as high pressure slides east. Warmer air continues to stream into the region by Wednesday where highs may crest to near 50 degrees for southern locations. Check back for the latest updates on this weekend’s snow chances and Sunday’s brutal cold.